Judy Cameron is the epitome of “breaking the mold”. 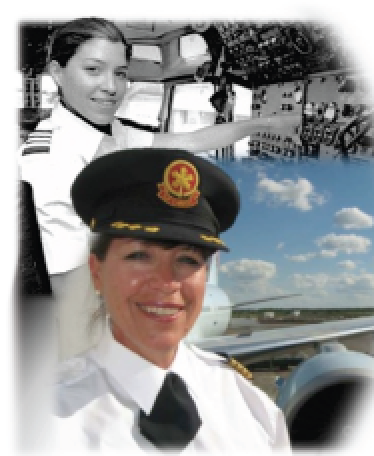 During her successful career as the first female pilot hired by Air Canada, Judy shattered several stereotypes. Looking back, Judy refers to a few lucky breaks. But with sheer persistence, Judy made her own good luck. Born in 1954 Judy was raised by a single parent mother, who did her best to give Judy a good start in life, including going to university. In 1973, after first year, Judy was hired by Transport Canada to survey pilots about “Itinerant Aircraft Movements”. (Transport Canada found that pilots, mostly male, were quite willing to respond to young women questioners.) When a young man offered to take Judy for a flight, he did what many have done in similar situations – he turned the flight into an aerobatic demonstration – showing off, with little regard for his passenger. However, Judy loved it! Within a few weeks she applied for the aviation program at Selkirk College. No doubt she impressed the Director of the program, a motorcycle buff, by riding her motorcycle for eight hours (Vancouver to Castlegar) to meet him. Though her male classmates accepted her reasonably well, as the only female in the class of thirty, Judy felt isolated at times. In 1975, the college’s first female graduate, Judy then worked for several different aviation companies, and eventually earned her way into a cockpit. She first worked as a dispatcher when the company directors vetoed a female pilot flying company aircraft. Next she was a reservations agent who doubled as co-pilot with no training, when Twin Otter and Kingair trips required a co-pilot. Then she was a DC-3 co-pilot and Aztec/Cessna 180 Charter Pilot with minimal training and flew poorly maintained equipment with a company which went bankrupt. As a DC-3 Co-pilot with a Chief Pilot who only agreed to hire her because the “airlines will never look at you”, she mostly flew charters, which included loading up to 6000 pounds of freight. Judy then sought an airline job. She was thrilled to receive a telegram from a regional carrier offering her a position and inviting her to discuss the work. Upon arriving for the appointment, she was informed that the Vice President refused to hire a woman. The company apologetically unhired her. Judy continued to apply to airlines and on April 10, 1978 Air Canada hired their first female pilot – Judy! No doubt her application was coloured by her 1200 hours on a DC-3, an 11,430 kg aircraft with two 1,200 hp engines which cruises at 370 km/hr. Judy was well accepted by Air Canada’s other pilots, likely because of her flying experience, determination and friendliness. Passengers frequently mistook Judy for a flight attendant, but she dealt graciously with them. Her first pregnancy gave Air Canada another challenge. They didn’t have a pilot maternity uniform. Other pilots had never needed one. Soon after Judy’s second daughter was born, she divorced and became a single mom. During her 40 year flying career Judy has logged over 23,000 hours in the DC-3, Twin Otter, Hawker Siddeley 748, DC-9, Lockheed 1011, Airbus 320, Boeing 767 and 777. In 2006 Judy was the first woman captain of the Boeing 767 and in 2010 the first female captain of the Boeing 777 in Canada. She has flown to major international destinations including Beijing, Shanghai, Hong Kong, Tel Aviv, Santiago Chile, Sydney Australia, London, Paris, Frankfurt, Rome, Madrid, Barcelona,and most major Canadian and USA cities. Issued a year after her May 24, 2015 retirement, the stamp features Captain Judy in front of a Boeing 767 in a photo taken by her husband Ron Swaisland. The First Day Cover, designed by Suzanne Wiltshire, includes portraits of Judy early and later in her career. Now Judy is living another dream – aerobatic flying. she credits her mother as a strong role model who inspired her to believe she could do anything she wished to do. And in living her mother’s credo, Judy is inspiring many other women, particularly those in aviation! The East Canada Section, Ninety-Nines are thrilled to celebrate Judy’s remarkable career with their 2015 stamp, which is available in four formats. With each order you will receive a brief bio which we encourage you to copy and send with correspondence when you use the stamps. Orders may be placed using paypal on the canadian99s.com website. Judy Cameron stamps are available in four formats. With each order purchasers receive a brief bio which we encourage them to copy and send with correspondence when using the stamps. Domestic Postage sheets of 50 can be used as regular letter postage, even after future rate increases – $80. A booklet of 12 stamps is useful for those desiring a smaller quantity for regular letter postage – $22. The Keepsake sheet features 25 regular sized stamps plus one large stamp – $45. A limited number of First Day Covers are available for $5 each. They will be of particular interest to the stamp collectors among friends and family. Sheets of 50 stamps, Keepsake sheets and First Day Covers may be ordered directly on the stamp order page with credit card or by printing the order form and mailing it, along with a cheque, to Bev Fraser, Box 56060, Fiesta Outlet, Stoney Creek, ON, L8G 5C9. An additional $4 cost will be required for mail orders. Please note that Judy Cameron stamps are not available at postal outlets.